The Hubble Space Telescope got some amazing shots of the aftermath of the collision between a celestial body of some sort and the planet Jupiter. Check out this report from Fox News. They estimate that the object was up to a few football fields in size. 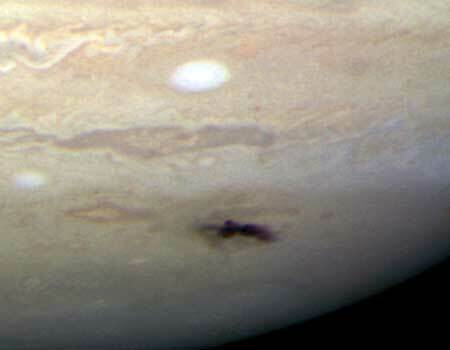 The photos in the link show a massive, dark gash in Jupiter’s surface. As a frame of reference, Jupiter is about 10,000 times larger than earth. That gash looks like maybe it is bigger than earth, or at least close to its size. Scary stuff. Take a look at Microsoft’s WorldWide Telescope for lots of images of planets, stars, galaxies, constellations, etc, plus a lot of other cool stuff and good information. Some of it is from Hubble. It’s a big website that requires a lot of memory to run; works in IE with the Silverlight plug-in or in Firefox. I didn’t try other browsers. Google and Bing are both good places to see lots of HST images. Go to either one of them, click on the “images” link, then type in “Hubble images” and submit. Lots of these look like they might have come off of George Lucas’ storyboard. Rats. Forgot about the image filter. Brian, just put in a link for the image.